Do you have a friend that is allergic to gluten? We have a handful and in all honesty, it’s stressful when I have to cook for them. It isn’t that I mind, but more like I am nervous the dish isn’t going to taste right or that I will accidentally cook something with gluten in the recipe when they come over. Even worse, I don’t have many gluten-free cookbooks, leading to me searching blogs online and sometimes ending up with recipes that are…well…a bit frightening. To my delight, however, I was recently asked to review a cookbook that sounded perfect and from a brand I trust – Bob’s Red Mill Everyday Gluten-Free Cookbook. Looking for delicious recipes that are not only gluten-free but use naturally gluten-free, nutrient- dense grains and ingredients? 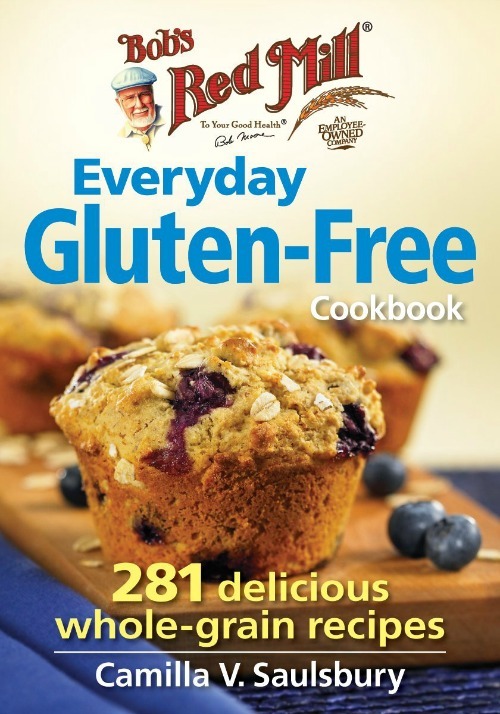 If so, we think you will love Bob’s Red Mill Everyday Gluten-Free Cookbook. For over 30 years, Bob’s Red Mill has committed itself to making the best gluten-free flours, cereals, baking mixes and grains, and prides itself in making sure all of their products meet their strict standards. With award winning recipe developer and bestselling author Camilla V . Saulsbury, they created a book using their fantastic products that is delicious, creative, and perfect for anyone’s everyday lifestyle. It doesn’t matter if you are going gluten-free for allergies or other health reason, we are certain you will find recipes to make your food even more nutritious and delicious with this cookbook! So far, I am impressed with the recipes in this cookbook. Not only are many of them easy to make, and nutritionally rich, making them perfect for just about anyone, not just those living a gluten-free lifestyle. I was especially excited to see so many amaranth recipes since I have read so much about this flour and all of its wonderful nutrients. Based on my own experience with this cookbook I am happy to give Bob’s Red Mill Everyday Gluten-Free Cookbook an A rating. Want to try this awesome book out for yourself? You can buy Bob’s Red Mill Everyday Gluten-Free Cookbook on Amazon.com or the Robert Rose publishing website. Want to see more books like this one? Check out Robert Rose Publishing on Social Media! I should get this book. I don’t know if gluten is a problem for me but when I eat certain foods (most food) I feel bloated after one bite and can’t eat the rest of the day. I especially have a problem with bread. I have been curious about the gluten free diet. I would love to try some new gluten free recipes. I have to get one my son has celiacs disease and I’m always using their products. Love finding great new recipes to make for him and my family that they can enjoy. My daughter and I have been talking about trying to eat Gluten free. I am a fan of easy recipes and could definitely use a good gluten free cookbook. My brothers neighbor went gluten free and said this is the best she has ever felt!! I love to use products from this company! Every morning I eat their Steel Cut Oats for breakfast with fruit. We have just started eating gluten free and I sure could use a gluten free cookbook. My Mom was diagnosed with celiac disease about three years ago. I’m always on the lookout for cookbooks that would be helpful for her.